Review of Founders All Day IPA | Beer Apprentice - Craft Beer News, Reviews, Interviews and Info. Hi guys. For today’s craft beer review I’m going to be turning to one of my all-time favorite brewers. 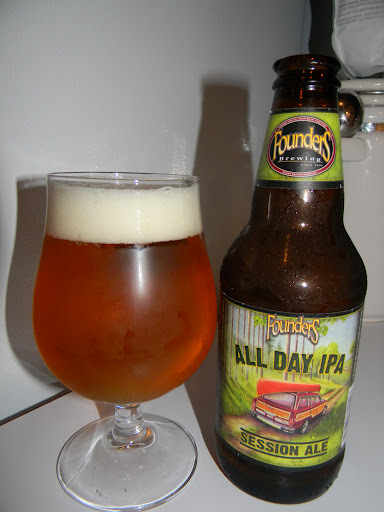 Founders Brewing Company located in Grand Rapids, Michigan and the beer I chose to sip on today is the All Day IPA. Let’s just go ahead and get to the website, foundersbrewing.com, and see what they have to say about this relatively new brew. Nice. What do you say we drink it? This brew has a relatively low ABV of 4.7% and it comes in a standard Founders 12 oz. bottle. It poured a predominately clear, golden/orange color with a substantially sized white head. It was soft, frothy and kind of rocky. The retention time was good and the lacing was quite satisfactory. I must say, a very nice looking beer. The nose was very fresh, clean and juicy smelling. Very citrusy with various tropical fruits including grapefruit and orange. Rather piny with some earthiness too. Maybe even the slightest bit of biscuity malt, but not much really. I really think Founders wants us to concentrate on the fruit…. and that’s fine by me. A fine smelling brew right here. The taste was, again, very citrusy. Fresh grapefruit and orange mostly. It tasted clean as well with an almost Pilsner”esque”, cracker/wafer type of malt. The hoppy components were very forward, however the bitterness was considerably lower than what I was expecting. Toward the end I thought I detected the most negligible spicy bite. It was very hard to decipher though. Nonetheless, this is a great tasting beer in my opinion. The mouthfeel was medium to light bodied. Very smooth, dry, snappy, refreshing and thirst quenching. It glides right across the palate with the greatest of ease. The palate was left with some flavor after the swallow, but not a terrible amount. It’s not overly sticky like a lot of IPA’s can be, therefore it left me wanting another gulp fairly quickly… and that’s always a plus. Man, I can see why so many people rave about this beer. It would, without a doubt, be a perfect beer for the Spring and Summer season. The drinkability is top of the line and even though it’s technically not a “session” beer, I would have no problem making a session out of it that’s for sure. I could pound several of these without even thinking about it. It has plenty of aroma and flavor to keep me interested throughout and on into the next bottle. If you guys are able to obtain some of the Founders All Day IPA I would highly recommend doing so. It’s just a fun, enjoyable and tasty drink that could be sipped on nearly “all day”. I want to, again, thank Mr. Liquid Bread (Chris Phillips) from the great state of Michigan for sending this beer my way. It’s most appreciated Chris.